Recipe provided courtesy of National Pork Board. Preheat olive oil over medium heat in a large skillet; add onion and sauté for about 5 minutes. 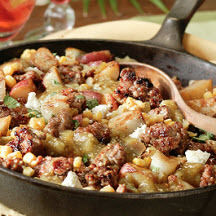 Add ground pork, breaking into crumbles with the back of a spoon and turning frequently until browned on all sides. Add potatoes, salsa and corn; stir and cook 8 to 10 minutes or until heated through. Fold in cilantro and sprinkle with cheese. Serve immediately. Nutritional Information Per Serving (1/4 of recipe): Calories: 360; Total Fat: 15g; Saturated Fat: 6g; Cholesterol: 80mg; Total Carbs: 27g; Fiber: 3g; Protein: 28g; Sodium: 810mg.